When lighting a grill, keep the top open until you are sure that it is lit. After connecting the cylinder to a propane gas grill burner for the first time, use a leak-detection solution (a 50/50 mixture of water and liquid soap) to check connections for tightness. 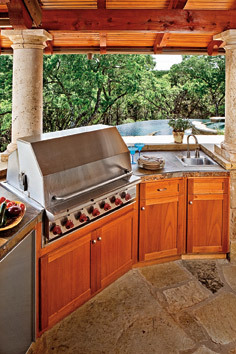 When a grill is not in use, cover disconnected hose-end fittings with plastic bags or protective caps to keep clean. When the cylinder is refilled, have the supplier check for dents, damage, rust, or leaks. After filling or exchanging a cylinder, take it home immediately. Keep the vehicle ventilated and the cylinder valve closed and capped. Always use or store cylinders outdoors in an upright (vertical) position. Always use or store propane cylinders outdoors in an upright (vertical) position. Never use or store propane cylinders indoors. Do not use, store, or transport cylinders near high temperatures (this includes storing spare cylinders near the grill).